This adventure started a year ago when I have been commissioned by Vice Video to make a short documentary for their new series: Digital Rebels. 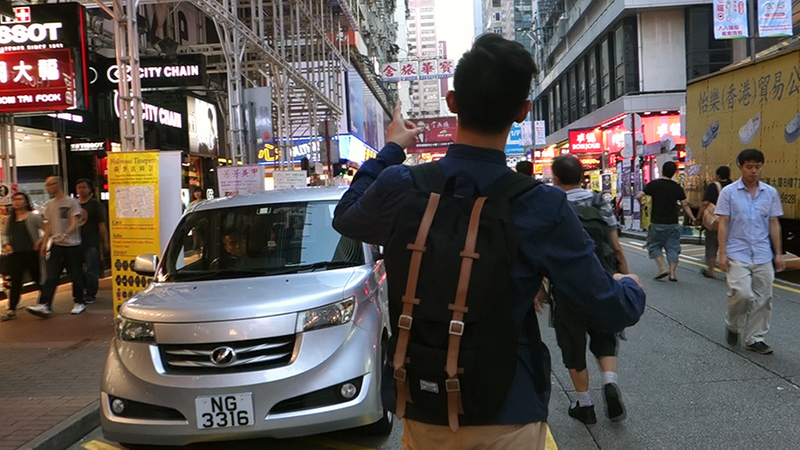 I spent two weeks in Hong Kong to meet Peter*, the legendary civic hacker from Hong Kong who brought the Civic Armor (also known as the Civil Rights Armour) to the demonstrations for a fairer democracy. Vice shut down the series project few days after I came back from HK. I got paid and kept the video files on a hard drive gathering dust. Not a single second of the cancelled documentary was ever released or shown, but I couldn’t get Peter’s story out of my head. I genuinely believe he is one of the most extraordinary guys I have met. A self-taught genius who has been shaking my beliefs beyond my techno-scepticism. With this article, built on the draft of my aborted documentary, I just wanted to pay a humble tribute to him. The following long-form article is based on a translated transcript of Peter’s words (“I” in the text) and screenshots from my original rushes as well as from documents collected during my investigation. I hope you will enjoy this story and hope it will support Peter’s actions. 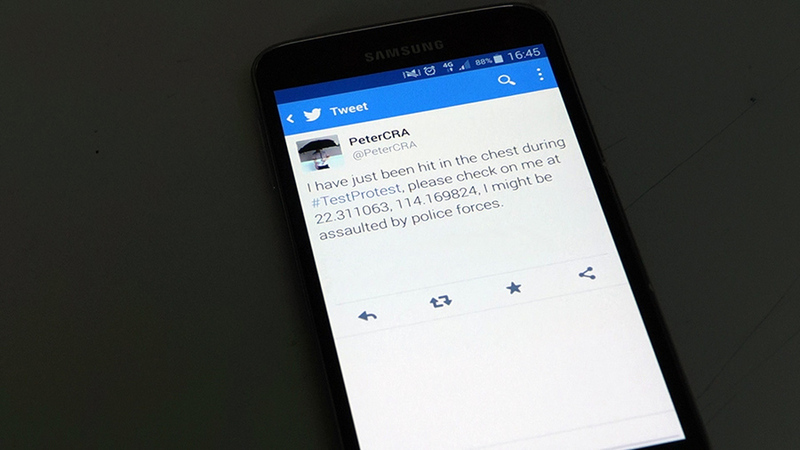 *“Peter” is obviously an alias used because of possible retribution by local authorities. 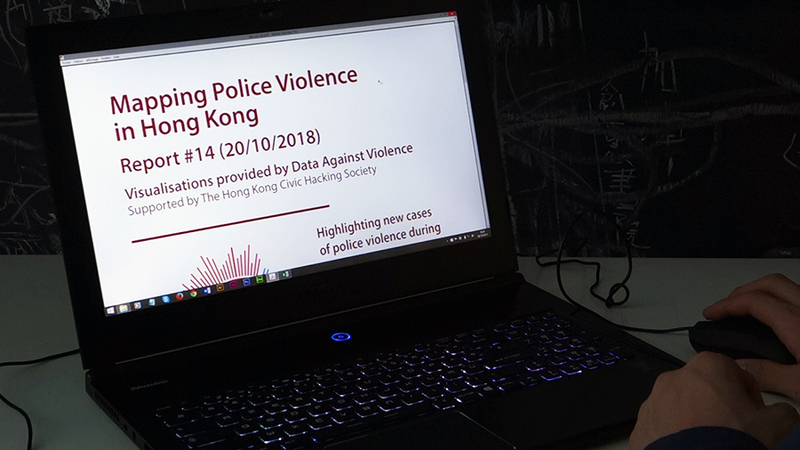 Today, he’s still active in Hong Kong, working on a new radical project fostering online civic rights. Notes from the field : My first glimpse of the Civic Armor was quite striking: it’s just one of the very mundane - almost invisible - smart clothes everyone is wearing today. Later, Peter explained to me that it’s what it makes it so efficient since it’s easy to conceal. Back in 2014, during what has been known as the Umbrella Revolution, we faced heavy police violence. As we were trying to push for more democracy, police forces tried to break us with many perverse tactics, especially by isolating and then harassing small groups of citizens. In some ways, the most efficient weapon they got was the fear. And also our silence when facing such violence. Police forces were wearing armours with protective plates, giving them an impressive look. At this time, I felt we also needed something to protect us, to protect our civil rights. 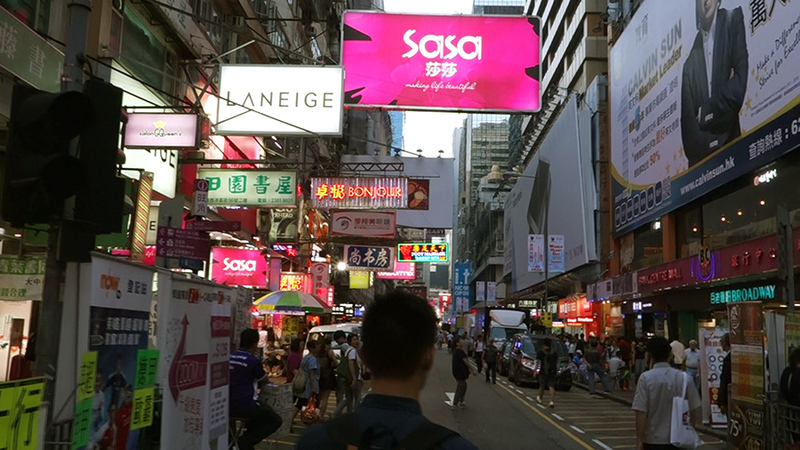 Notes from the field : The vibrant Mong Kok district, the epicenter of the protests, is still the place where communities gather to challenge local authorities and reclaim democracy. During the same period, I stumbled upon the Charleston Project, on the Internet; I think it was few weeks after the “end” of the protests. This initiative really stroked me. I thought “It’s what we need”. This project was started by the Afro-American hacker community from Charleston in the US. The city had faced days of riot after another cop choked to death a defenceless black kid during the arrest. 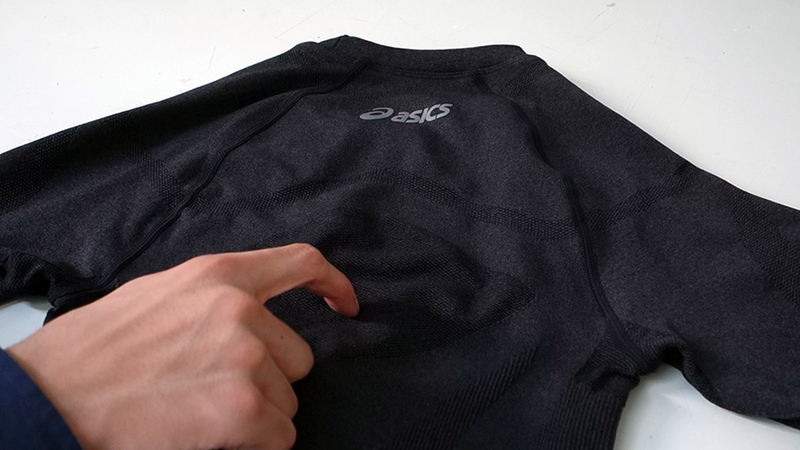 The hackers have started to tweak a common sports wearable, a connected compression shirt, to use it as underwear preventing acts of violence from the police. 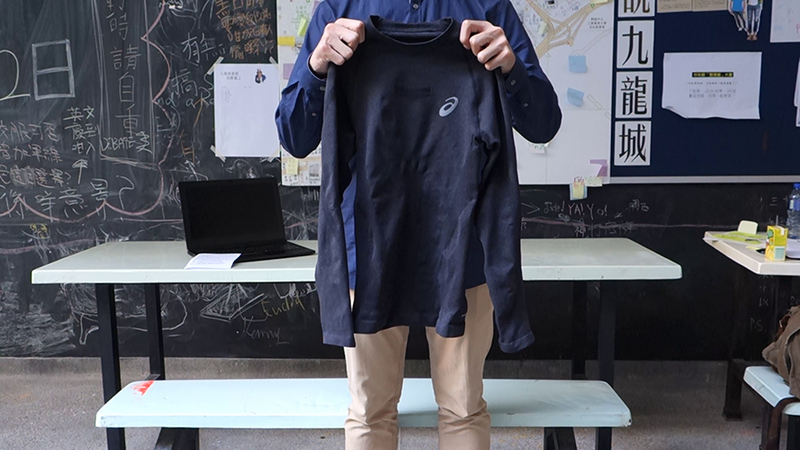 The idea was dead simple: the device was secretly recording the vital signs of the person wearing the smart t-shirt and used them as a concrete proof to denounce police violence. They envisaged it as a connected second skin, protecting your rights by having its own memory of violent arrests. From what I heard, the data collected by one of this disobedient wearable had been successfully used during a lawsuit against a police officer charged with excessive use of violence and assault. Hopefully, the Charleston Project team had put online all the instructions regarding the conception of the wearable, so I was able to start my own prototype. So, a year ago, I built the first version of what I called the Civic Armor, sometimes also coined as the Civil Rights Armour, or CRA. It was based on the draft from the Charleston Project, but I tried to adapt it to the Hong Kong context. I felt we needed to document and then publicly expose the use of violence by police forces, but also to have an efficient tool to coordinate our efforts to overcome this repression. 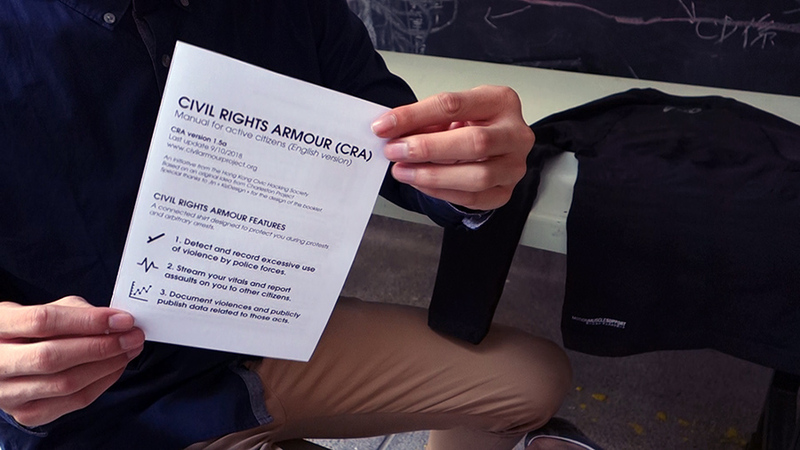 Our Civil Rights Armor is building on the original features of the US version. It is recording your vital signs in real time and transfers them to an online black box accessible by the community. It then starts to livestream vitals on a public online platform when the wearable feels you are under attack. I kept the idea of a secured depository where the vital signs of the demonstrators can be stocked and then later be used to demonstrate the unnecessary use of violence by police forces. 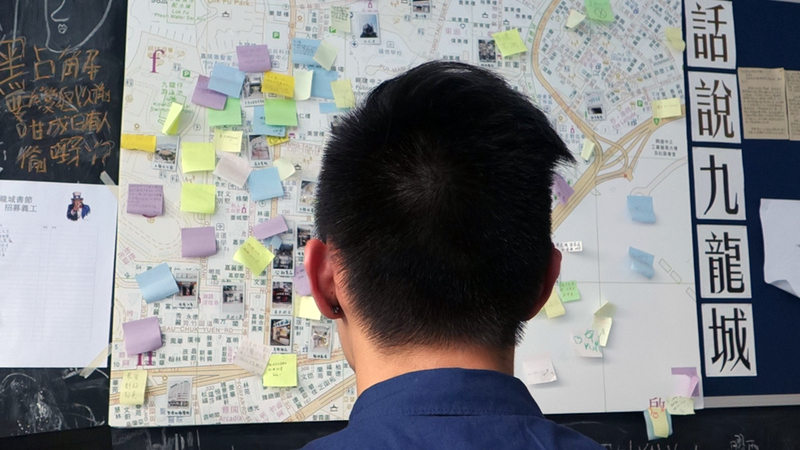 But in the same time, I felt LifeStream, the interface used by the Americans to monitor the status of each connected activist, was a bit, let’s say, off topic compared to what was happening in Hong Kong. I wanted something more public, something that could reach out to the world. I then connected the smart shirt to my Twitter account. When my vital signs were skyrocketing, it tweeted a possible aggression, with my symptoms and my location. I felt that, by allowing the wearable to warn my followers of a possible aggression, it would highlight police violence locally but also internationally. When you think about it, it is an absurd approach to police violence, but hey, we needed to start somewhere. The hacking process was surprisingly easy. Actually, getting the wearable was the hardest part. When I started to work with the Charleston version, they only provided one hacked firmware for a precise model of wearable. They were only few pieces available here in Hong Kong at the time, whereas it was easily distributed in the US. But thanks to the precise and precious documentation from Charleston hackers, I started to build my own version. They published nicely written and illustrated guides to help beginners and non-tech savvy people to create their own protecting wearable. I wanted to keep this DIY approach, by opening and distributing the documentation of my own version. Here is the manual I designed for my own version of the CRA. This is the English version, but I also edited one in Cantonese. You can design step-by-step your CRA and download a hacked firmware ready to be used. I also published a series of video tutorials to help everyone making a CRA. It was mandatory to be able to spread it in the upcoming protests in HK. So this is the last version, the 1.5a also named “Arnold”, developed for various models of sports wearables. Mine is based on a simple GS-101 from Asics. Normally, it is supposed to record your vitals to help you track and optimize your physical performances. I hacked it to turn it into a CRA. As I was explaining earlier, we use it as a black box: it records your basic vitals such as breathing rate, heart rate, blood pressure, body temperature and muscle activity. Abnormal vitals are recorded with their geolocation. A warning message is also tweeted through your Twitter account and an alert is publicly published on the LifeStream channel of the protest. LifeStream is an online and open platform designed by the same team as the Charleston Project and allows you to monitor the vitals of each participant remotely. Here is my Twitter history during a small protest in Mong Kok at the end of last October, in 2018. As you can see, I was caught in tear gas and some messages warning about the fact I’m in danger had been triggered, requesting some help. At this point, I also created a simple plugin helping protesters to set a special hashtag for the automated live-tweeting of police violence. Then, everyone at the protest following this hashtag could see in real time where the violence might happen, and then decide to carry assistance to isolated protesters. I know that in Charleston, they used the geolocated feature to quickly dispatch a legal team on site to help citizens molested or brutally arrested. Beyond this need for coordination between activists, I think it is also important to spread traces of violence on the Internet, so they won’t be forgotten. Twitter was useful to reach an occidental audience, hoping they would pressure the HK and Chinese governments to make things change. Notes from the field: Peter is pointing where a communication scrambler was previously installed during the process weeks ago. I also feared the local authorities would shut down the communications during protests. It would be then impossible to live-document the violence and police forces could continue to act with impunity. I thought about it after being arrested. Fortunately, police officers didn’t really question me about what looked like an innocent sports shirt. It is the real strength of the Civil Rights Armor: it is concealed and if eventually found no one could figure it is not your classical sports wearable. I have recently learned that some citizens have been molested during interrogation, the CRA recorded all of it. I hope it might highlight the unacceptable treatment received by political prisoners. So, now, the information about the violence you are enduring is also saved in a local backup situated in the flash memory of the wearable. 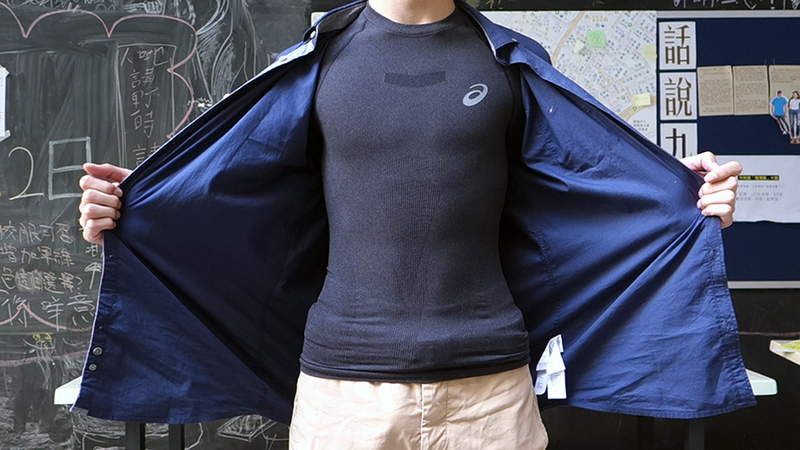 Notes from the field: For this wearable, the system directly stores the data in an additional memory ship sween stitched in the shirt. 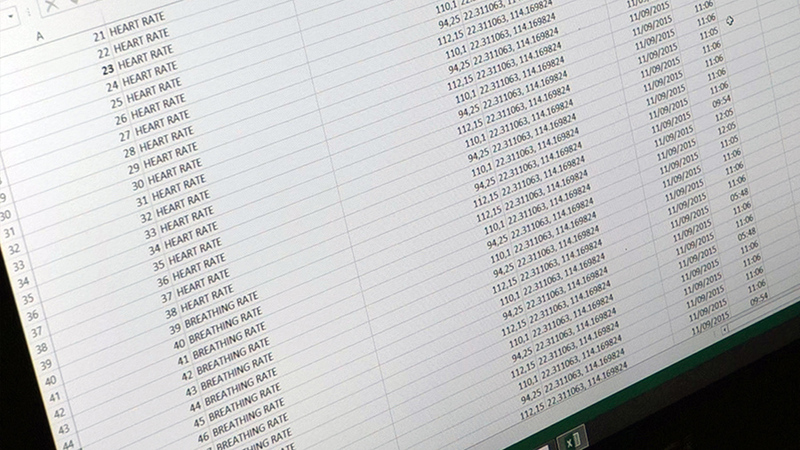 All the data collected are as many proofs of potential acts of violence from police forces. Some data activists have produced visualisations with this publicly accessible data, highlighting different cases of aggression in recent protests. We want to use these data as key messages in public campaign to raise awareness on the use of violence. Then the public could ask for accountability to the local government. We hope for some measures that would reduce the use of what is no more, no less a political violence. Notes from the field: Data Against Violence is an initiative collecting data from civic wearables to expose police violence during protests. This is a rough prototype, build on the previous version. It is still recording and live-tweeting your vitals when you are assaulted. But if you look closer, I have mapped the internal structure of the wearable with sensors from medical socks that can be found on the market. Look, tbe systems records and tweets the fact that you have been it at the torso. Notes from the field: Peter is still working on what he calls now "dissident tech", in opposition to the on going civic tech washing. While I’m finalising the second version of the Civil Rights Armor, I’m still struggling with security concerns: what if all the activists’ geolocated data were used in the end by the police forces? We also have to find a way to secure enough wearables, by hacking to new firmware before the authorities start to trace the purchases of the existing models used for CRA. Or even worse, block the importation of such goods. We are also now setting different sessions called “deployment workshops” where we teach how to build a DIY CRA. The idea is to equip enough citizens for the next demonstrations and so ensure their safety. You know, fear should switch sides: a police officer beating up a protester should now fear that his actions could be recorded and could lead him to troubles. 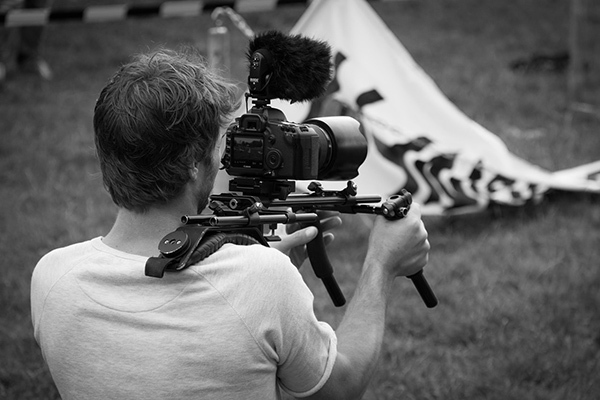 Welcome in the backstage of Mads Thorsen’s documentaries and short films.